NEWARK, Del.–(BUSINESS WIRE)–The clear majority of families believe higher education is well-worth the investment, and most students and parents are willing to stretch themselves financially to make it happen, according to “How America Values College 2018,” the national study from Sallie Mae, the nation’s saving, planning, and paying for college company, and Ipsos, an independent global market research company. Sixty-six percent of college-going families believe they are getting a good value for the price they’re paying for college: 36 percent report they are paying a fair price, 10 percent say they’re getting somewhat of a bargain, and 20 percent believe the education is worth every penny. Nearly 80 percent of families say going to college fulfills the American Dream. Eighty-three percent of families believe the student will earn more money with a college degree and the expected median starting salary range after college is $40,000-$59,000. The importance of a college education is rising; 77 percent of students and parents believe a college degree is more important now than it used to be. Families, even those willing to stretch financially, are taking deliberate, resourceful, and concrete steps to make college more affordable. Forty-five percent of college students are working year-round to earn money for school, and 37 percent of students live at home with parents or relatives to save on housing costs. Sixty-seven percent of students are cutting back their spending, and 24 percent of students are taking classes over a shorter period of time in order to graduate sooner and reduce costs. Planning, and ultimately paying for college, involves terms and jargon that may leave families scratching their heads. When asked a series of true or false questions about certain paying-for-college terminology, 42 percent of families mistakenly believe work-study funds are automatic, more than 20 percent believe “free tuition” means college is free, and 19 percent believe the sticker price is what college will cost them. 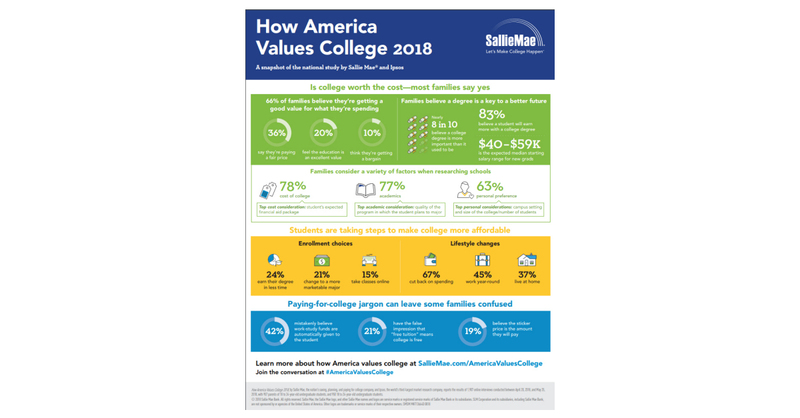 “How America Values College 2018” reports the results of 1,907 online interviews Ipsos conducted between April 20 and May 25, 2018, of 957 American parents of undergraduate students and 950 18- to 24-year-old undergraduate students. The survey sample reflected a cross-section of key demographic variables in the United States. Respondents were able to take the survey in English or Spanish. The complete report and a related infographic are available at SallieMae.com/AmericaValuesCollege. Ipsos is a global independent market research company ranking third worldwide among research firms. At Ipsos, we are passionately curious about people, markets, brands, and society. We make our changing world easier and faster to navigate, and inspire clients to make smarter decisions. We deliver research with security, speed, simplicity, and substance. We believe it’s time to change the game — it’s time for Game Changers! Visit http://www.ipsos-na.com to learn more. Sallie Mae (Nasdaq: SLM) is the nation’s saving, planning, and paying for college company. Whether college is a long way off or just around the corner, Sallie Mae offers products that promote responsible personal finance, including private education loans, free scholarship search tools, free college financial planning tools, and online retail banking. Learn more at SallieMae.com. Commonly known as Sallie Mae, SLM Corporation and its subsidiaries are not sponsored by or agencies of the United States of America.